This one does a little more than just borrow the resources of Dark Forces, though. It's clearly set up around the time of the original Star Wars movie but one distinct parallel in the plots is that you're a mercenary, here named Wrok Onmo, who ends up working for the rebel alliance. Where Kyle Katarn was after the Death Star plans, Wrok is concerned with the Imperial Cybernetics Facility schematics first because Quatto the Hutt wanted them... for some reason... and once his deal goes south you go to the next available broker, the rebel alliance. The pitch in the .TXT is far more exciting than reality since the "disagreement" with Quatto and your rebel spy in Mos Denra are all wonderful, off-camera things. It's probably for the best, though, since such events would likely end up as stilted as the beginning-of-level briefings between Vader and his subordinate detailing your current status. Which isn't mean to be a dig on Rex; I feel that cutscenes in the Doom games are usually if not inevitably lacking. Claussen says that The Darkest Hour uses a hub system but can be played from pistol starts as is your want. 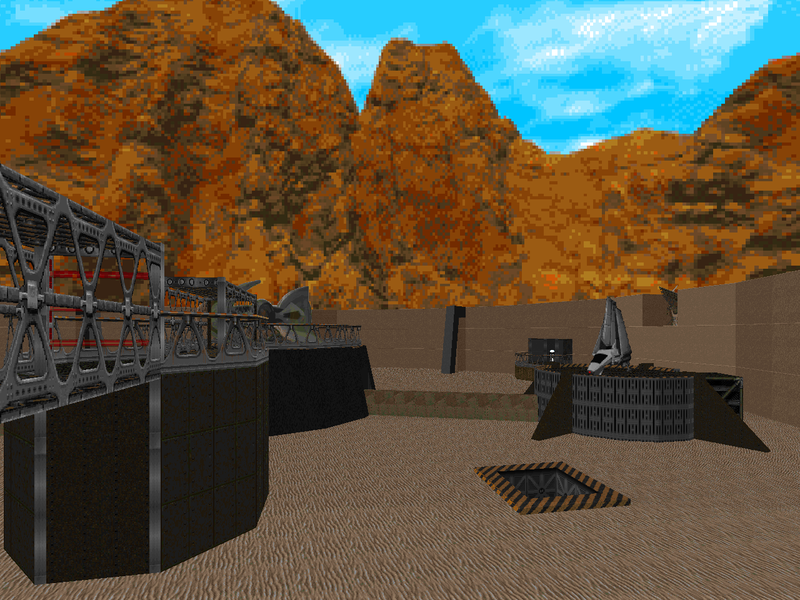 I'm not entirely sure how this would be achieved in the finale, since it requires an excursion to MAP06 in order to enter the computer network / robotics factory portion on the opposite side, but I want to throw it out there. 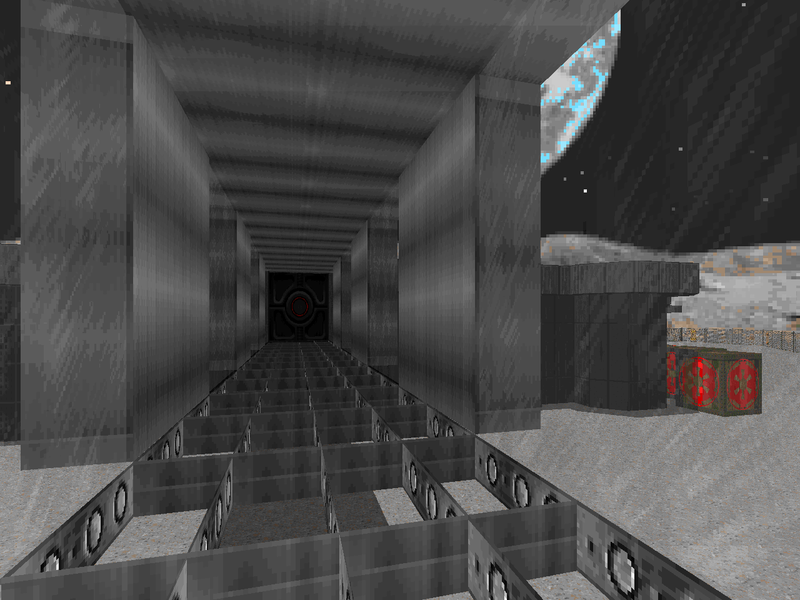 Personally, I wouldn't recommend it; every level beginning appears to be some kind of survivalist nightmare from the moment you climb out of the crate in the Imperial Moon Base and the secret level is even worse; I wouldn't go there unless I was toting a BFG, personally. It doesn't help that the relative realism of Rex's level design is amplified by perfunctory monster placement, but challenge mode is there. 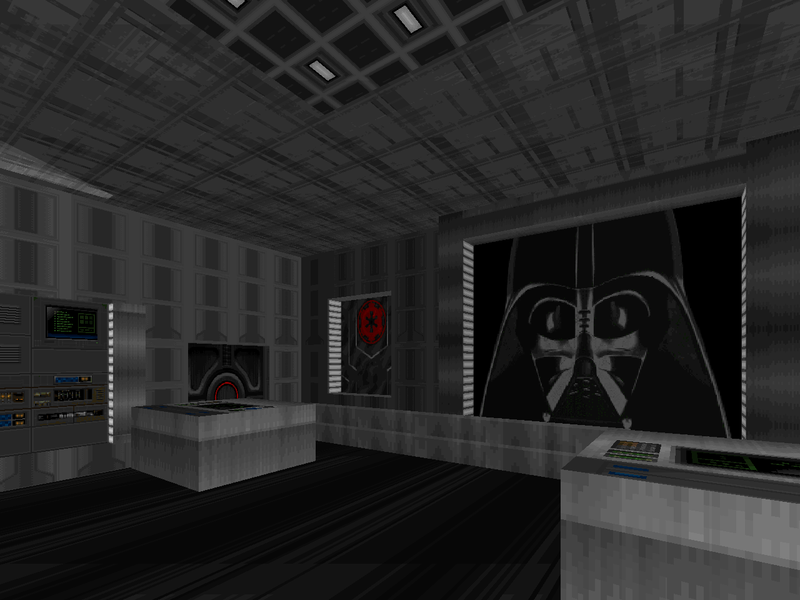 Like Paranoia and Half-Life, DARKHOUR replaces just about every sprite with Star Wars resources. I think that the new actors fit much better into their Doom II counterparts, though, compared to how the Half-Life replacements came out. Sure, it's hard to tell the shotgun guy and imp equivalent apart (subtly different Stormtroopers), but it's mostly an issue in wide-open area levels like Mos Denra. The lowly zombiman and the mighty revenant don't show up in any form while the chaingunner and arch-vile have been turned into mini-bosses. The commando becomes the tougher, faster Mandalorian, making for a tense fight in the docking bay where you battle him. Satan's sorcerer becomes the rogue jedi, a fast-moving melee attacker who is more shocking than lethal. The weapons haven't been touched as far as behavior goes which led to some consternation from folks who were expecting actual beams of plasma out of the Star Wars guns they know and love, not the hitscanner bullet puffs left by the pistol, shotgun, SSG, and chaingun. 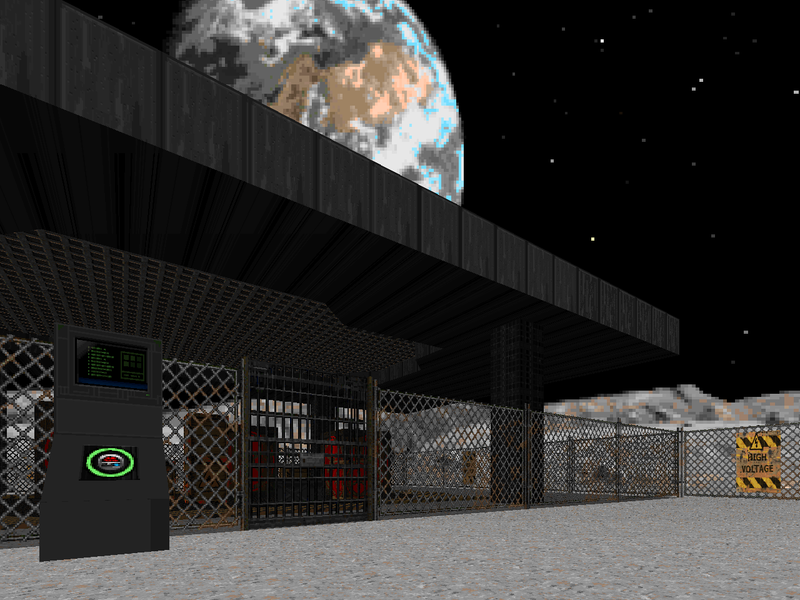 I'm pretty sure that Rex couldn't do any better in ZDoom circa 2001, though. If you're looking for Star Wars plasma bolts then I heartily suggest LilWhiteMouse's Chibi Rebellion which should offer energetic discharges from a variety of pseudo-futuristic weapons. I'm not put off by the bullets nearly as much as being able to hit a Stormtrooper with a rocket and seeing them gib into a red mess, a bit of a departure from the usually sanitized Star Wars. Then again, Wrok Onmo is a walking blood tornado who lays waste to every location he visits, cackling with impish glee whenever he picks up a weapon. 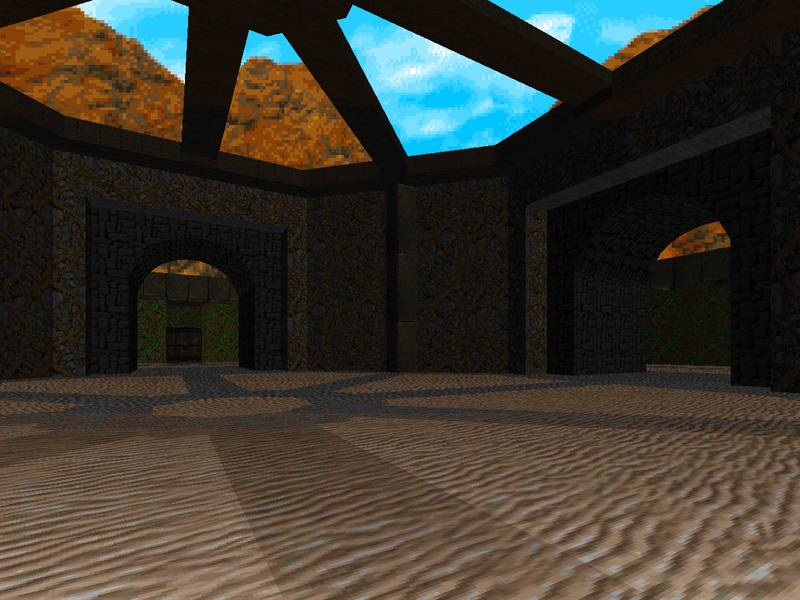 2001 brought one huge change to the ZDoom engine: slopes! 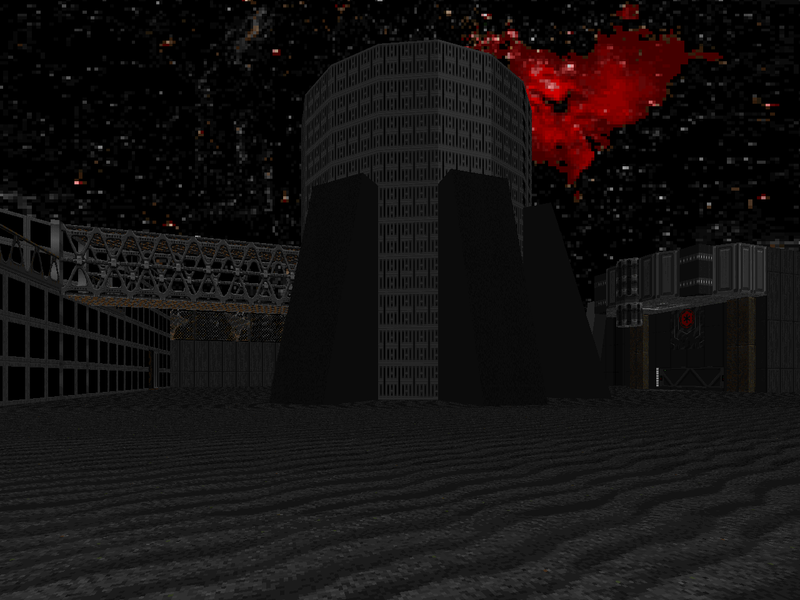 The Darkest Hour stands alongside KZDoom7 and Sin City as the vanguard of advanced source port features, making up ramps and other neat bits of machinery like long, sloped elevators that I'm sure Rex wished he had available for Paranoia but also allowing for structures like domed roofs, previously accomplished via some sort of midtexture or sprite cheat. 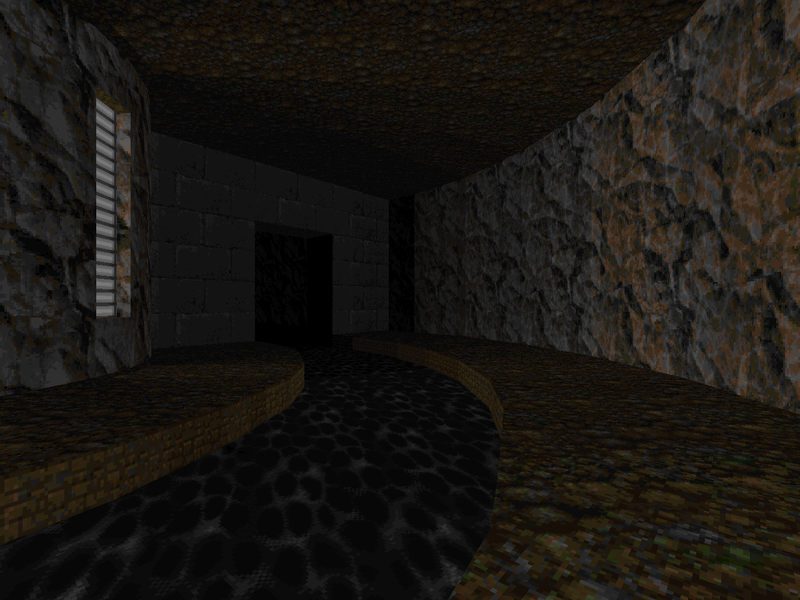 Which isn't to say that DARKHOUR eschews cheats; there's still stacked midtextures to simulate thicker, irregular door frames and room-over-room tricks (a descendant of 3D bridges, perhaps?) allowing you to do things like investigate the basement of Mos Denra buildings as well as their covering "roofs". Unabashed self-plagiarism continues to define Rex's authorial career. I'm sick of the same spiral staircase, seen in sequential series in MAP03 and once again in MAP07; I'm tired of the pointless pistons, purportedly purveying the production of power. MAP06, "Aqueducts", fares even worse as it features the same hallways, elbows, intersections, and storm drain grates symmetrically staffed by one stalwart Jawa each. There's also the largest room from COMPLEX's waste processing facility, brought here and then rotated. 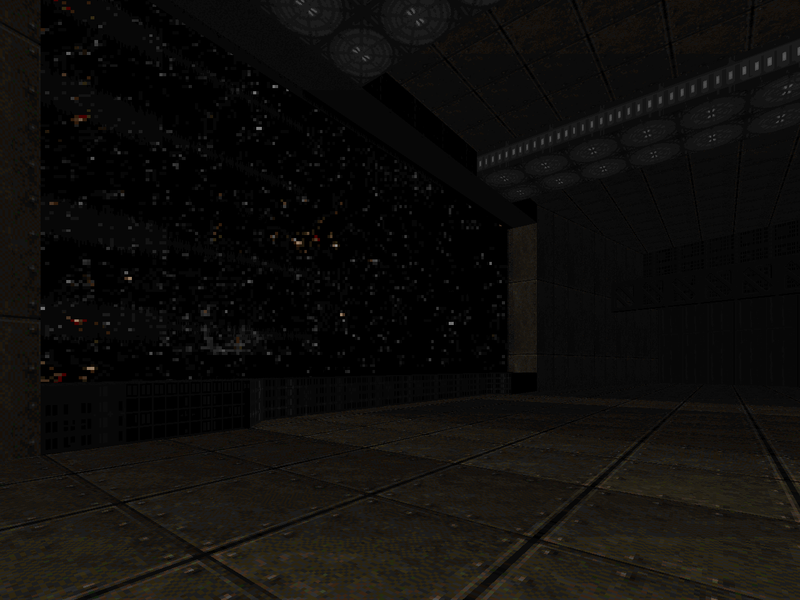 MAP02, the Imperial Space Station, appears as the nadir of this phenomena, repeating the same general room arrangement four times as you travel the circumference of the level. You're not beholden to murdering the entire contingent of soldiers but it seems to be a consequence of the lack of any clear objectives or intel (i.e. go here to release locks, leave for Tatooine, etc.). Claussen's execution of Doom realism is accurate insofar as his structures resemble actual sewer systems or space station loading docks but they lack the embellishments that make such places interesting to explore. These could be in variety of encounters or engrossing combat (hah!) or the imperfections that render a more robust character and which the poorly-defined Doom design school of Russian Realism appears so proficient at. Perhaps the authoritarian, sterilized aesthetic of the Galactic Empire is not conducive to adding freckles as such; even so, I would prefer clean and abstract architecture to sterile, utilitarian symmetry. 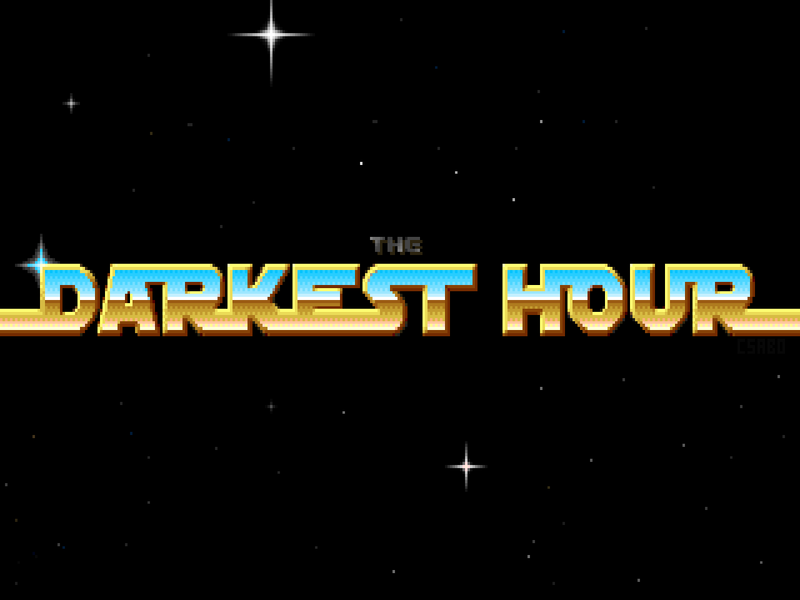 That said, The Darkest Hour is still worth a play, especially if you're a Star Wars fan. 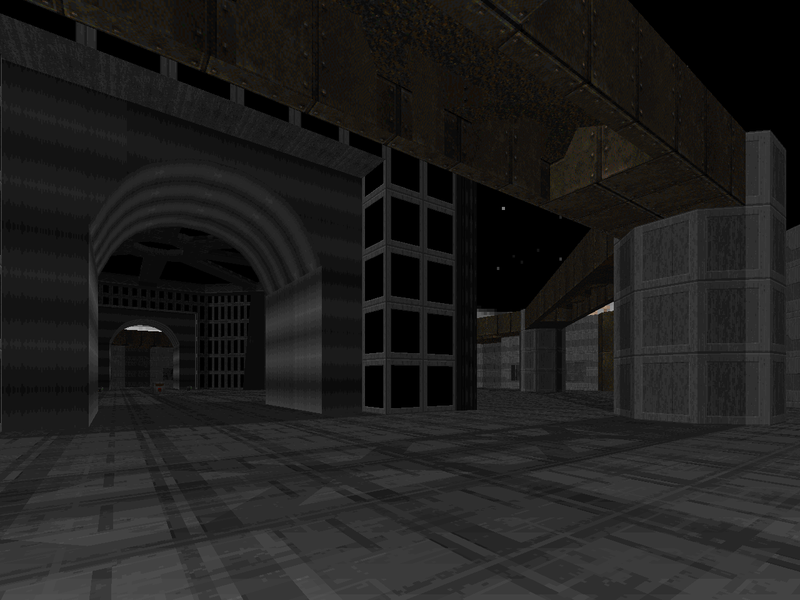 Dark Forces fans might be a little disappointed; maybe with The Force Awakens we'll see a renewed interest in making galactic game mods for Doom-derived engines. Until then, I guess I have Rex's Dawn: A Prelude to look forward to. Rex starts things off with a BANG. Token resistance? More like trying to kill you as soon as you jump out of the box. Not knowing which soldiers are imps vs shotgun guys makes things kind of sketchy to start but you'll settle into it pretty quick, especially once you build your health back up. The novelty of Star Wars masks some of the banality of the identical structures and there are a few cool setpiece areas like the central computer core bit and the shuttle bay. Not too sure about the electric fence, though. On the one hand, if you try to clear this level in full it will be a chore since it's mostly storm troopers in a big ol' circular layout. On the other, it's really more of a smash and grab mission with you trying to get back to your ship after assaulting the main command station. Walking around elsewhere is just looking for trouble... but will also net you some goodies in the many Half-Life cargo crates scattered around. 2nd Trip: A token scattering of soldiers... Plus the Dark Trooper. There are some new supplies spread out so it pays to go searching again, where you'll nab goodies like more cell ammo. The shift to Tatooine is a nice change of scenery and a complete break with the previous gameplay; the Hutt's guards and mercenaries are all descended from the demon, Hell knight, and Baron, plus an arch-vile derived miniboss appears as the "rogue Jedi". The opening fight is pretty crazy whether you're starting out from carryovers or not; the main change will be having to corral the initial wave of Gamorreans since standing your ground may leave you overwhelmed. It's a prime candidate for Berserk baiting, though the different sprites will throw your timing off. The palace isn't too exciting to explore but you can open up several weapon caches and the desert oasis / wilderness that surrounds the palace is pretty cool, featuring a cave infested by Jawas (SS Nazis). The mini-boss came as a welcome surprise. 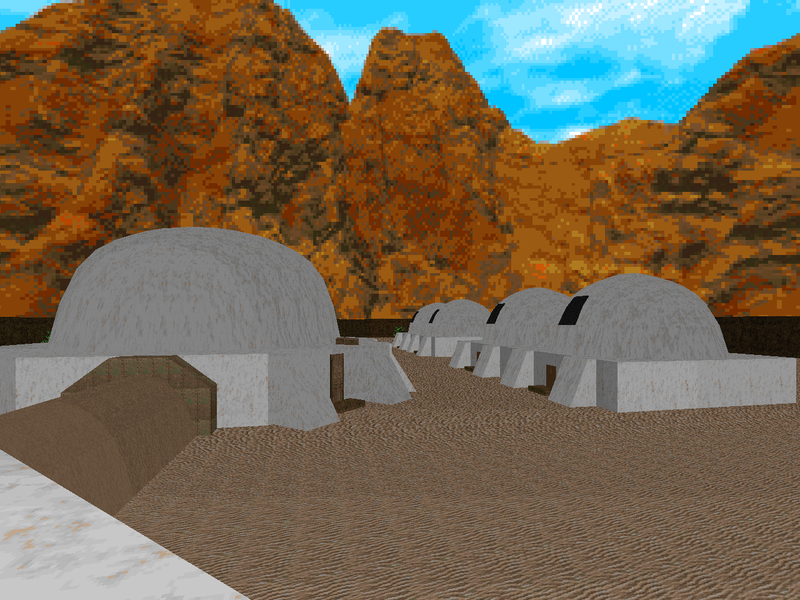 More Tatooine wilderness in some unimaginative canyons, but the architecture of the adobe-like dwellings is spot on and has a couple of really cool room-over-room cheats to create basements. The action is pretty bleh except for the Mandalorian (a super-powered commando) who is dueled in the southern base, and the opening, which can quickly bring you up close and personal to the world's tiniest AT-ST (Cyberdemon). You'll also get to experience bacta tanks and get your first taste of the plasma gun as well as the imposing-looking pain elemental replacement. A brutal gauntlet that can only be worse from a pistol start; it even seems to be oriented for Berserk / chainsaw / trap play. All of the health laying around cannot hope to lessen the sting of the Mandalorian / cyborg room. The first leg is all about monotypical monster arrangements; the plasma troopers lead, followed by Gamorreans and then the pain elemental replacements. After the Mandalorian fight it's on to a kinder, gentler platforming section with some nukage; not bad. The AT-ST battle cribs the chicken switches from Rex's previous Cyb crusher encounters, requiring you to dive into four different trenches and then ride five timed pillars to flick switches at their top in a place where getting hit by rockets seems more a function of luck. The final insult is the Dark Trooper, which must be led up and down long hallways featuring missile launchers staged about halfway through; hopefully you take him to an end and then run back to the mesh-windowed bunker to launch a volley per button press. Since the hulk has no trouble shooting at you through the window you'll likely eat some bullets if you do it this way. You're probably going to eat enough to die. The rogue Jedi is but an afterthought. Some really cool architecture and megastructures with the sloped buttresses and clearing the yard out is a fun initial battle. You can do a good bit of exploring, discovering a return of the Bacta tank setup from the previous level as well as the spiral staircase / central room combo, but this time it's refreshingly used for a bit of eye candy. 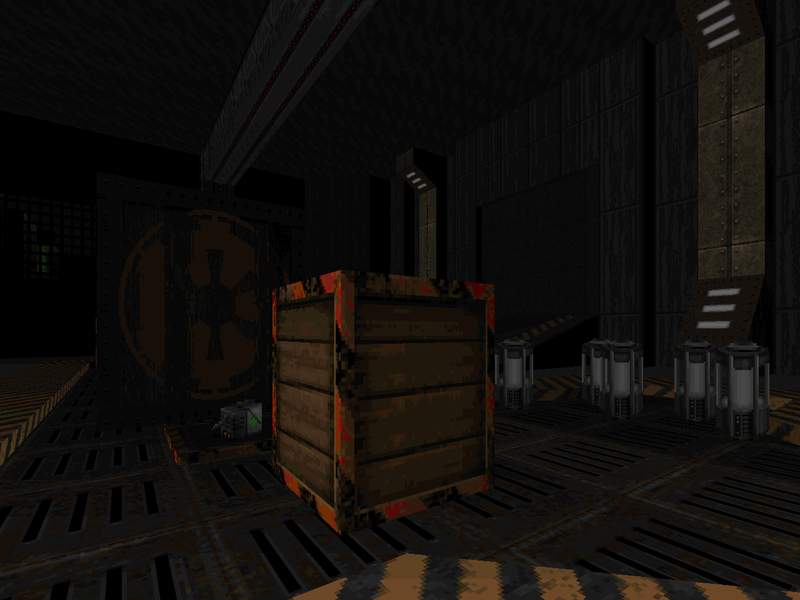 Another cool thing are the sloped elevator platforms, reminiscent of Half-Life, whose crates also figure in pretty heavily. 2nd Visit: Time to exit! The southern computer complex is a really cool bit of architecture, even if the inexplicable piston rooms are copy and pasted. There's supposed to be a super-imposing battle with two Dark Troopers but since they're Spiderdemons they will easily ruin each other. At this point you can start laying the charges, the last one triggering an escape to the shuttle you came in on which will be fraught with probulators and spy droids. Starts out pretty cool but turns into an arrangement of identical tunnels with indistinguishable junction guardians; a jawa behind every barred grate! 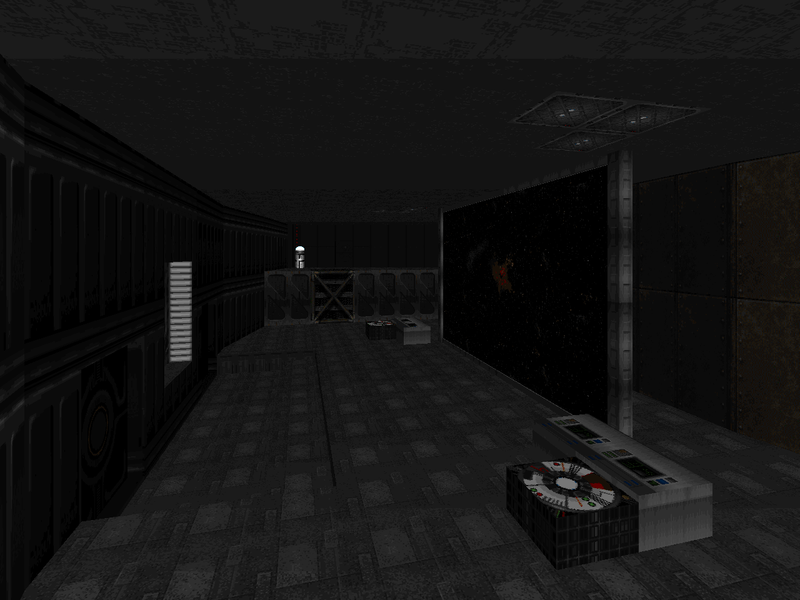 I'm also slightly let down that the southwestern room is a copy of the largest chamber in Military Research Complex's waste processing facility, including the enemy placement, but c'est la Rex. Boring to explore and a chore to clear, but pretty short. 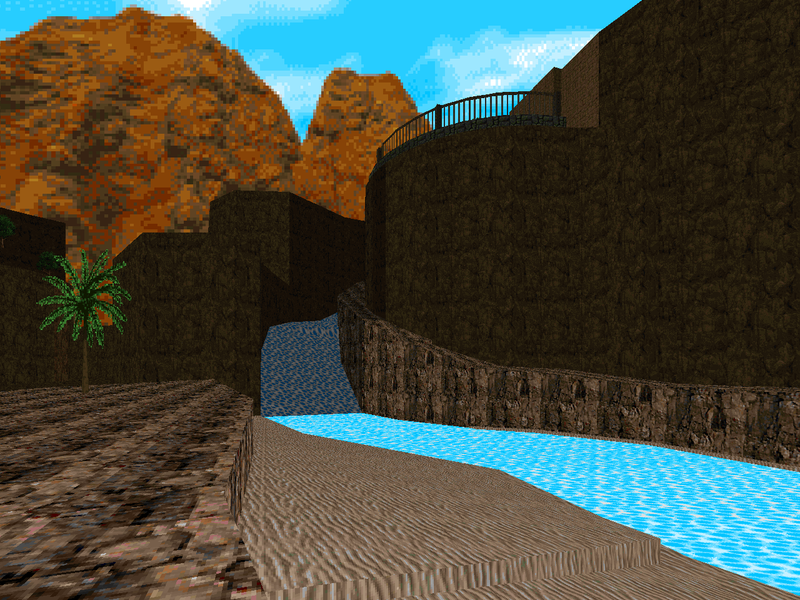 It's a change of scenery, at least, and I dig the way Rex used the animated water ripples on rock wall texture to create the illusion of rippling light reflectiong off the aqueducts in the elbow sections. I had high hopes for this one going in, but there are just too many poor design choices, not the least of which being level 3's bs start point surrounded by a hundred gamorreans. And is there no way to change message display speed in zdoom? cos it seems all the cutscenes made in this way are impossible to follow because the dialogue swooshes by in less than a second. The yoda laugh for weapon pickups always makes me giggle though. It's flawed but cute. I imagine that the message display speed was just fine when DARKHOUR was originally released, only buckling under the port's years of refinement that followed.